Dépanneur! I just love people who know words I don't. Without your explanation I would have taken it for the pathologist's assistant with the electric saw who takes off the top of the corpse's skull. Super trip, super description, your usual high standard of interesting photographs. I would have taken it for the pathologist's assistant with the electric saw who takes off the top of the corpse's skull. On the Brooks counterpart of the Dry-Lites: The idea is similar, for sure. I used to have a pair of sling-over-the-seat pannier for my old AJS scrambler. Both the Brooks and the Dry-Lites look to be more functional than the no-name brand I used for the Ajay. Arkel intends the Dry-Lites for commuting and short trips -- I think they may well work as rear panniers on longer trips too. Thanks for your kind words as always, Andre. I thought of you and your paintings when I saw the flowers beside the marsh. Class john that bike of your's look's stunning fantastic set up. how do you think the Dry-lites will hold up over time? Arkel says that the Dry-Lites are not (expected to be) as robust as their other touring products. From the look and feel of them, they seem to be well made, and of durable reinforced (rip-stop style) nylon. 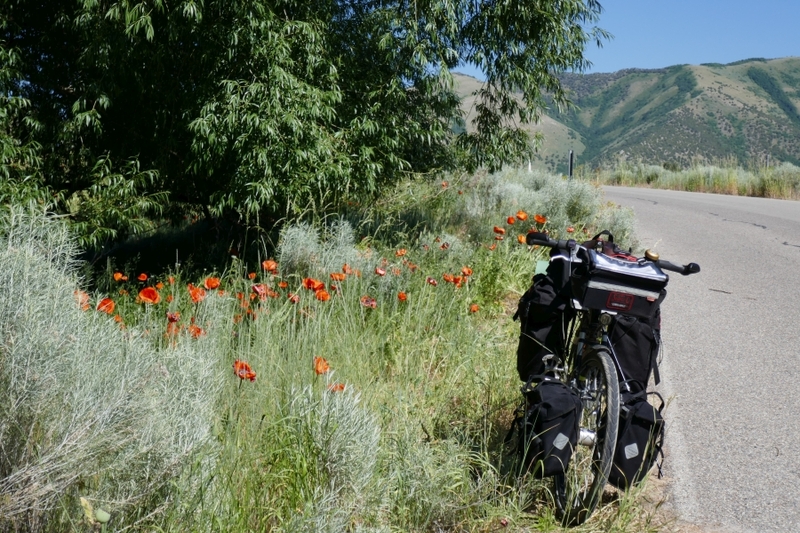 I doubt that they'd last as long as the HD cordura nylon panniers which Arkel makes, however, esp if one chucks them around campsites, into the beds of pickup trucks, etc. I use my better-quality panniers almost exclusively for touring. This means that they get used intensively for a few weeks in all sorts of weather, and then not much 'til next time. I tend to look after my camping/touring stuff quite carefully, partly because I buy good quality stuff, party because I don't want it to break at awkward times, partly because I'm slightly obsessive about keeping it all in good nick. On balance, I shd think they'll last me for a few years. Only major qualifier is that, if the raccoons get 'em, all bets are off. Glad you liked the rivers! We are so privileged to live beside the Ottawa and its tributaries. A fine local journalist, Roy MacGregor, recently wrote Original Highways: Travelling The Great Rivers of Canada. Well worth a read. Thanks, Anto, you're too kind. Did I tell you about the great hub in the back wheel?? class bike John your health to ride it. That's a hugely varied environment you live in, Jim. I presume that if those dirt roads carried any appreciable traffic, they'd long since be tarmaced over and, by virtue of being tarmac, attract more traffic. A cyclist's paradise. US-89 is a quite busy road through Willard and Perry. In a lot of places there is no shoulder. It's two lanes in each direction so mostly the traffic can give cyclists some space, but sometimes there is a cluster of cars that makes that infeasible, and sometimes people just have a bad attitude. But, aha, there is a way just to the west of US-89! You should be able to see a bit of bike path in the map. 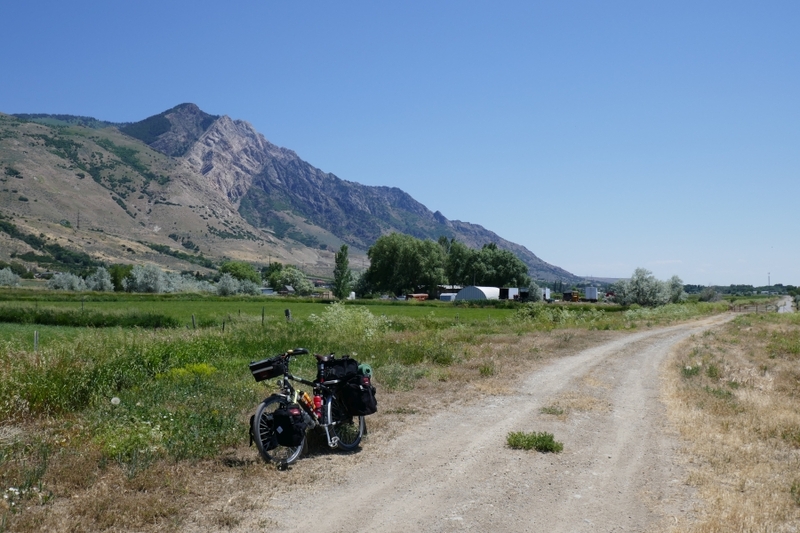 The photo is facing south: you can see that the dirt road runs back to a gate - that's the northern end of the bike path. The map just shows a disconnect at that point, but it is certainly bike-able. Slowly slowly I am expanding my horizons. Close to home there is an incredible amount of construction and the roads are too narrow and too busy. But head out and it gets remote ... wow, Utah really gets remote! Lots to explore! Here is some of the nearby remote territory .... this ought to be doable, I think! Thanks for posting, Jim. Some great shots of your Carradice decked Nomad in Utah. A few years back I was fortunate to spend a few nights camping and hiking in Zion. Fabulous country and yes, very remote in places. Particularly liked 'Goblin the Utah equivalent of the Easter Island Moai. If there is a next time for me my Nomad might be coming too. Lovely photos Jim, looks a good climb at the end and an excellent place to camp.